Be accepted and be currently enrolled in the undergraduate program at PBA. Complete the supplemental application and essay for admission to the School of Pharmacy. Complete the 66-67 hours of pre-professional requirements (see table below) with a minimum grade point average of 3.0 for both cumulative and science courses. 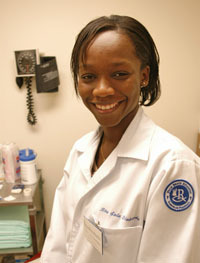 All pre-professional course work should be completed by May of the year seeking admission into the School of Pharmacy. Exceptions to the May deadline will be reviewed on a case by case basis. Take the Pharmacy College Admission Test (PCAT) and score at least 50 percent on the composite score. The PCAT must be taken no later than the January test date. Complete at least 33 of the 66-67 hours listed above at PBA. Grades below “C-” cannot be accepted toward completion of these requirements. A failed course taken at a previous institution can be retaken at PBA, but cannot count toward your 33 hours. The cumulative pre-pharmacy and science (Chemistry, Biology and Math) grade point average (GPA) requirement is 3.0 or higher. The Pharmacy College Admission Test (PCAT) should be taken during September or January, but no later than January of the year prior to application for admission to the School of Pharmacy. Students must score in at least the 50th percentile on the main composite score to qualify for Early Assurance. Eligible students will be invited to an Interview Day at the School of Pharmacy. You will interview with a three-member interview team consisting of Pharmacy faculty, current Pharmacy students, alumni and employers. The Admissions Committee must recommend the student for admission. Submit supplemental application and essay for admission. Submit three letters of recommendation to the School of Pharmacy. Interview by a Pharmacy faculty member, receiving an unconditional favorable recommendation from the School of Pharmacy Admissions Committee. Successful completion of all required courses by May of the year seeking admission with cumulative and science grade point averages of 3.0 or higher. PBA students who fulfill the Early Assurance requirements will be required to apply through the Pharmacy College Application Service (PharmCAS). Students who transfer to PBA to complete their pre-pharmacy undergraduate requirements MAY be eligible for a guaranteed interview. Complete at least one full academic year (Fall/Spring semesters) at PBA. Complete a supplemental application and essay. Apply through the Pharmacy College Application Service (PharmCAS). Complete the 67-68 hours of pre-professional courses with a minimum grade point average of 3.0 for both cumulative and science courses. Take the Pharmacy College Admission Test (PCAT) and score in at least the 50th percentile on the composite score. The PCAT must be taken no later than the January test date. Transfer students must meet the admission requirements for the Undergraduate Admission Office. Transcripts are required from all colleges and universities attended. For further details, contact our PBA undergraduate admissions office at 888-468-6722 or (561) 803-2100 or via e-mail.